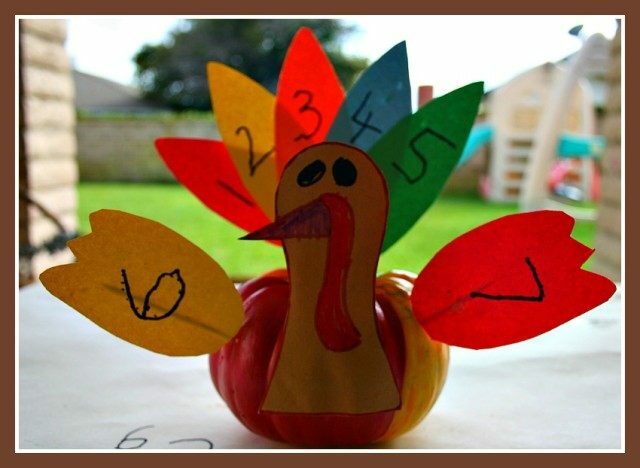 This Thanksgiving craft can double as a turkey craft and a pr school writing and math activity. We started off with painting the pumpkin (body of the turkey) in various turkey feather colors. You could use just use brown for the body of the turkey.I set out some acrylics with a metallic finish. Once we were done, daddy promptly asked if we were making a red bell pepper! My heart sank :l Of course I came back with “Since when do bell peppers have 5 different colors?” To be fair, the pumpkin does look like a bell pepper from this angle. We let the red bell pepper a.k.a pumpkin to dry and came back to the project the next day. 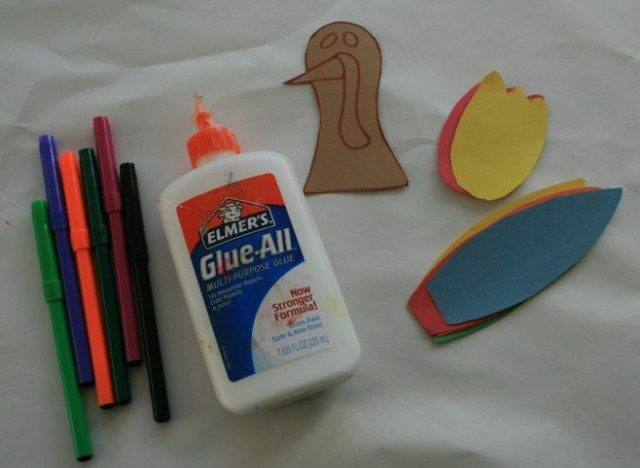 For the turkey, I cut out some turkey feathers, body and wings using this printable. It was a good time to encourage my older one to try writing a few numbers. It didn’t need a lot of push because she is going through a “ I want to write letters and numbers all day” phase. Really, it is borderline weird Having said that, I’m sure this play based/ craft based learning will encourage any kid to write. 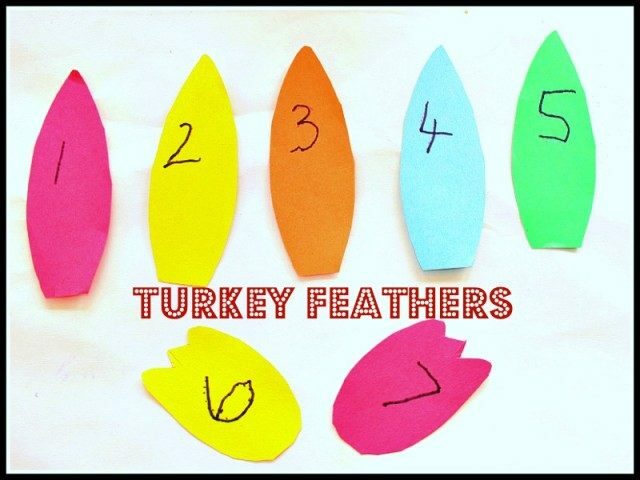 An opportunity to use markers on colored pieces of paper doubling as turkey feathers and wings suddenly makes writing very exciting. I set out the feathers where she traced a few and wrote a few numbers. While I went inside to get some more toothpicks, she got zealous and wrote some freaky inverted numbers on my workspace. Hurray to budding interest in writing. We stapled the feathers together and stuck a toothpick on the back. Next, the wings went on the toothpicks and were set out to dry along with the feathers for a while. After she colored the turkey eyes and wattle we glued the head to the pumpkin body. Attaching the feathers and wings should not be that hard because we are working with a mini pumpkin. I helped Big A push the toothpick into the pumpkin. Once the feathers, wings and the head is attached, your number turkey is ready for display. It could work as a center piece for your kids table on Thanksgiving day. It could possibly work as a handmade Thanksgiving gift for teachers/class etc. 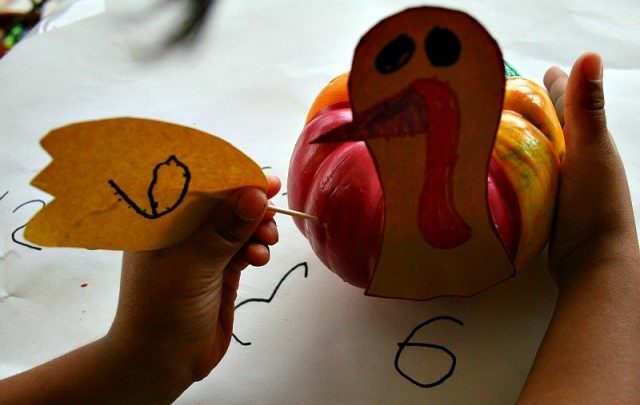 This Thanksgiving craft is just a basic model. You could clearly do more – more feathers, attach individual feathers to the pumpkin. Work with letters, sight words, word families. 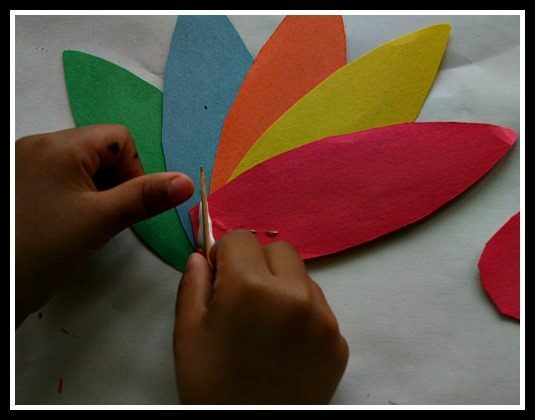 Knowing your child’s attention span will help you tailor the project for your kid. 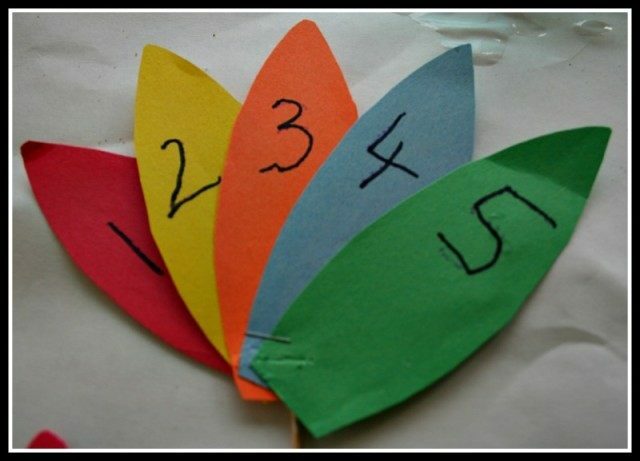 My children love this turkey craft. 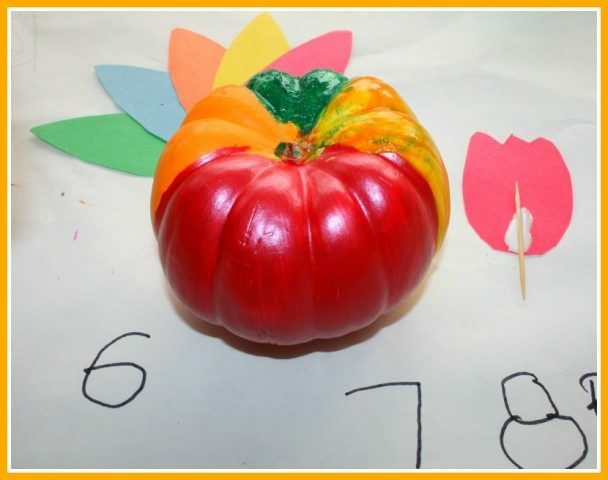 I painted pumpkins for Halloween with my class-but the paint peeled off. 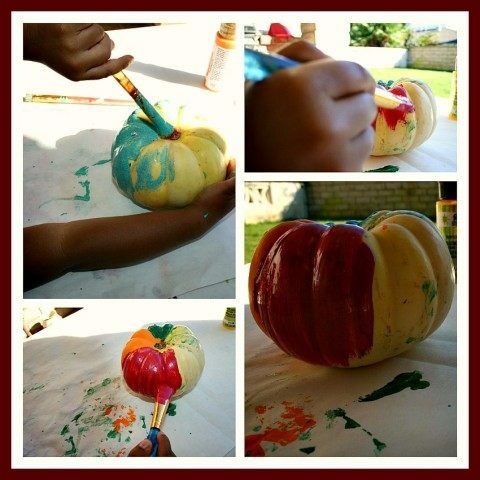 What is the secret to having the paint stick to the pumpkin? Any water based paint flakes off after it dries. But acrylic paint sticks on without any trouble. 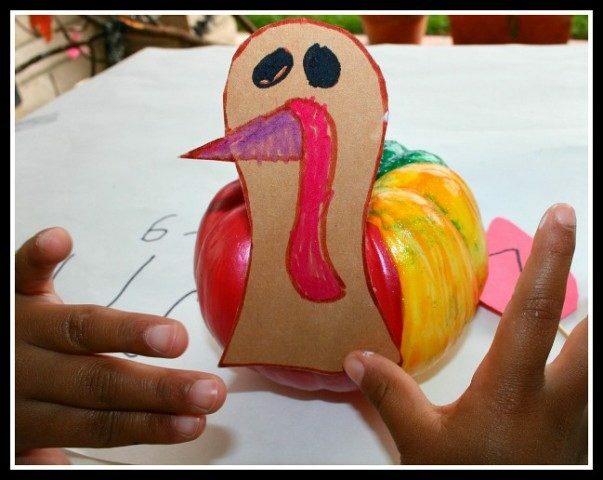 This turkey is so cute and I love that it triples as a craft, writing and math activity. Also thrilled that I finally got on your site! Yeah. This activity can take so many directions. I’m thinking of using the turkey for sight words. Thats so cute! Thanks for linking up to tip-toe thru tuesday. I hope we see you back this week. Cute idea! Each feather could have an adjective describing the turkey or Thanksgiving. Yeah you can extend this activity in many directions. so many fun ways to use this – very creative. I am featuring this on this week’s Sunday Showcase. Thanks for sharing. 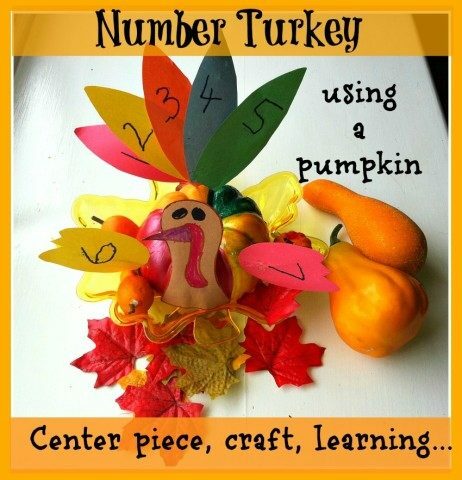 Ooh love the combination of turkey and pumpkin craft!